Artesani Playground Wading Pool, 1255 Soldiers Field Rd. Boston (Brighton). 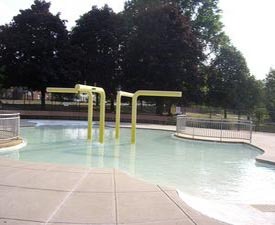 Artesani Playground Wading Pool, conveniently located along the scenic Charles River is absolutely fabulous for area families. Includes a number of zero depth fountains from the ground and they have an awesome wading pool with all kinds of waterfall like things. The wading pool has lifeguards on duty, showers, changing rooms, picnic area, ice cream truck comes often, awesome playground for toddlers and older kids and plenty of parking. Truly is a gem. This place is always packed with kids and families even during the weekdays. A nice alternative to frog pond. Spray Deck is open under the following schedule:May 23 – June 21, open weekends (and Memorial Day)only, 9:30 a.m. – 7 p.m.
June 27-September 7 Open daily 9:30 a.m.- 7p.m. This is the sort of thing that makes me grateful to live in the States, and especially Boston. We are so lucky to have this place! Love that public funding supports this sort of special spot. Just wish it were more accesible to kids not in Cambridge. Just an update; on 7/31/11 the pump was broken. According to the staff it has been broken for 'a few weeks', and 'a part is on order'. I'll leave it to your judgment as to whether it will be fixed in 2011. If anyone DOES get an update, please post here, Meanwhile the sprayers are working at about 1/4 power with no water in the pool itself (just letting the water run down the drain). So not technically closed, but not fully open either. I took my 2 girls here last week. What a wonderful place right along the Charles River. 2 gated playgrounds, one for little ones & one for older ones. The wading pool was very nice. There were at least 3 lifeguards at all times. My 5 yr old had a blast. It was also perfect for my 6 month old baby. I would definitely recommend this place.